The National Museum of Singapore was opened as the Raffles Library and Museum in 1887. The museum was founded in 1849 and the collection was previously housed in the Singapore Institution, which is considered the oldest school in Singapore. It was briefly moved to the Victoria Theatre and Concert Hall, which then existed as the city hall. The new building was commissioned in 1882 and was designed by architect Henry McCallum, but was built to a revised and scaled-down version by JF McNair. A modern annexe by W Architects was added in 2004-06, featuring a glass-clad rotunda inspired by IM Pei. The former Attorney-Generals Chambers, which is now part of the Parliament Building, was originally built in the 1880s, though the current design dates from 1906. The first building on the site seems to have been completed in 1839, as an annex to Maxwell's House (also known as the former Parliament House), which is considered the oldest surviving building in Singapore. The General Post Office, which also housed the Singapore Chamber of Commerce and other government office, was built in 1924-28. It was the largest project launched for the occasion of the centennial celebrations in 1919. The design was by architect Keys & Dowdeswell, who also built the Capital Theatre and Singapore General Hospital. It was the third GPO on the site, the first was built in 1873 and the second in 1885. The post office had previously been housed in a building near the city hall, since 1854. The GPO was rebuilt to become a hotel in 1997-2001 and is now the Fullerton Hotel Singapore. The Bank of China building was built in 1954 by architects Palmer & Turner. It was one of the first towers in the central business district and the first to include central air-conditioning. The same architects were behind similar towers for the Bank of China in Hong Kong (1952) and Shanghai (1937). 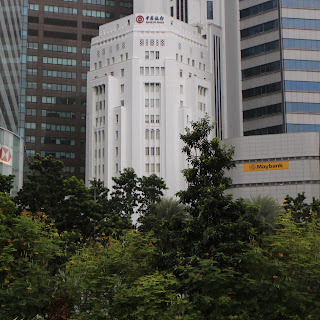 The Asia Insurance Building was built in 1953-55 to a design by architect Ng Keng Siang. At 87 metres, it was the tallest building in Singapore at the time. It was converted to serviced apartments in 2008 and has been renamed Ascott Raffles Place. The Concourse was completed in 1994 after a redesign in 1987 of an earlier project called the Hong Fok Centre. The latter first began construction in 1981 but was halted due to an economic downturn. The redesign was by Architects 61 and Paul Rudolph. It is located in the strip between Beach Road and Nicoll Highway known as the Golden Mile. The office tower reaches 175 metres. UOB Plaza was completed in 1995 to a design by Japanese architect Kenzo Tange. It consists of two towers joined by a podium. The earlier tower is from 1974 but was redesigned as a smaller twin to UOB Plaza 1, which became the second tower in the CBD to reach 280 metres in 1992. The Bonham Building was one of the earlier buildings on the site of the smaller UOB Plaza 2. OUE Bayfront at 50 Collyer Quay was built in 2007-11 to a design by DP Architects. It replaced the Overseas Union House from 1971, which was an 8-storey office and car park building with shopping facilities. Reflections at Keppel Bay is a residential complex completed in 2011 to a design by Daniel Libeskind. The complex consists of six high-rises and 11 low-rise villa apartment blocks. It followed the earlier Caribbean at Keppel Bay, which was the first residential development in Keppel Bay in 2006. A development named Corals at Keppel Bay was also completed to Libeskind's design in 2016. 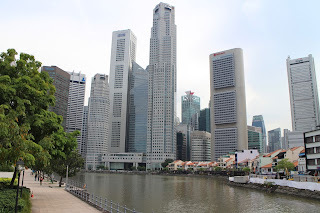 Marina Bay Financial Centre was designed by Kohn Pedersen Fox and built in two stages. The first two office towers and Marina Bay Residences were completed in 2010. The largely subterranean mall was also first opened at that time. The third office tower and Marina Bay Suites were officially completed in May 2013. The towers are between 192 and 245 metres. Oasia Hotel Downtown was completed in December 2016, to a design by Singapore-based WOHA Architects. The 190-metre tower is clad in a red aluminium mesh to allow the integration of vines, plants and flowers. It includes four open-sides sky terraces that provide vistas and cross-ventilation. The design has been presented as a prototype for land use intensification in tropical urban environments. Marina One (left) is a scheduled for completion in 2017. The project consists of two office towers and two residential towers, with a retail podium and garden roof. It was designed by Ingenhoven Architects.